What’s colour got to do with it? Well, more and more research is proving that it means quite a lot. Brown fat and its link to weight loss could help you to literally change the biology of your fat cells. With a few simple and easy habits, you can get in on this supercharged fat loss tactic. First, let’s talk a bit about white fat. This is the type of fat that stores energy. This is where your body fat percentage comes from, and it makes up most of the body fat you have. While it’s necessary to our functioning and well-being to have some white fat, this is the stuff that is dangerous in excess. On the contrary, brown fat burns fat much like muscle. We know that more muscular bodies burn more energy throughout the day leading to easier weight loss and weight maintenance. Turns out, brown fat has a lot more in common with muscle than it does with white fat. 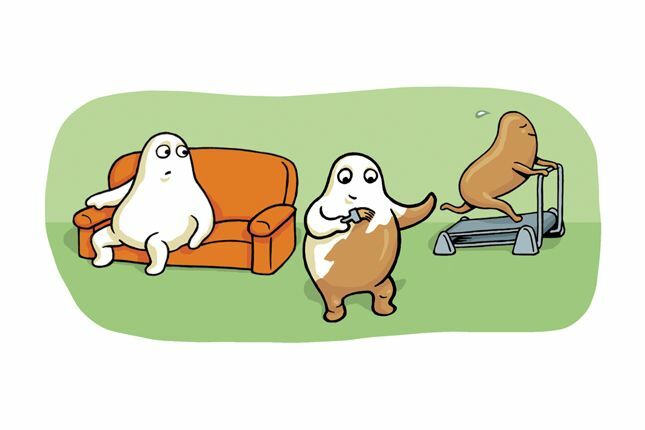 Without deeming these fats “good and evil,” let’s think of it this way: brown fat heats whereas white fat stores. Brown fat converts energy into heat which essentially translates to burning calories. In many mice studies, brown fat has been shown to improve resistance to obesity. It improves blood sugar metabolism, and people with lower blood glucose levels tend to have more brown fat than those who don’t. This means it could help individuals with diabetes. Brown fat can increase your metabolic set rate, otherwise known as how many calories you burn doing, well… nothing! Imagine the weight loss benefits from burning an extra 200-300 calories a day without exercise. Animal studies have shown that brown fat protects people from diabetes. It was once thought that only babies have this elusive brown fat, so if you happen to be an infant, you’ve got an upper hand. Presumably, you are an adult, so how can you stimulate your body’s brown fat stores? Well, there are a few easy ways. Chill out a little. Cold temperatures activate brown fat’s thermogenic properties. Your body will naturally seek warmth, and it will find it wherever it can. Mild temperatures of just 16 degrees celsius (61 fahrenheit) can activate brown fat activity and increase metabolism. Get buzzing. No, we’re not talking about alcohol. We’re talking about that “fight or flight” response, generally thought of as an unpleasant reaction to stress, anxiety, or stimulation. There is a middle ground. Drinking coffee can elicit sympathetic stimulation. Eat just enough. Simple, right? This is an effective strategy for weight loss overall, as eating too little leads to increased hunger while overeating simply isn’t good for the waistline. Eating what you need turned white fat into brown fat in a study with mice. Pump some iron. Or ride your bike. Whatever floats your boat. An animal study showed that working out triggers the release of an enzyme called irisin that prompts white fat cells to convert to brown. Get munching. Ursolic acid, found in fruits like apples, cranberries, blueberries, plums, and prunes can increase brown fat and muscle mass. Have some fun. Go out and play. A more stimulating environment can increase brown fat cells and help you lose weight. This has been studied with mice. Besides, play is good for the mind, too! While brown fat has a long way to go in terms of being studied in humans, there are some simple changes you can make to potentially increase brown fat and stimulate weight loss. As far as we can tell, the most convincing strategy is cold exposure. So, think twice before you bundle up!